I knew flying to London with the small person would be tricky — especially without my wife. Was I nervous?Yes. With memories of him as a toddler, shrieking, and me being his 2nd most-favorite person, I was definitely nervous. Ultimately, we were better than fine. No actual crying on the plane — even though he didn’t sleep at all on the outbound (Continental Airlines), he slept 3 hours (thankfully) on the return (Virgin). – Def check main bag — don’t want to chase the small person and leave bag unattended – u should be able to “run” with all bags and small person if needed. – Not sure I would take Paddington Express from Heathrow — if you know a car service (as opposed to a Cab) the financial result is about the same 35 pounds one way via car. We both would have appreciated his mom’s presence. I’m sure he was slightly concerned for his own well-being as usually I have some assistance to insure certain levels of discomfort aren’t breached. We did good. 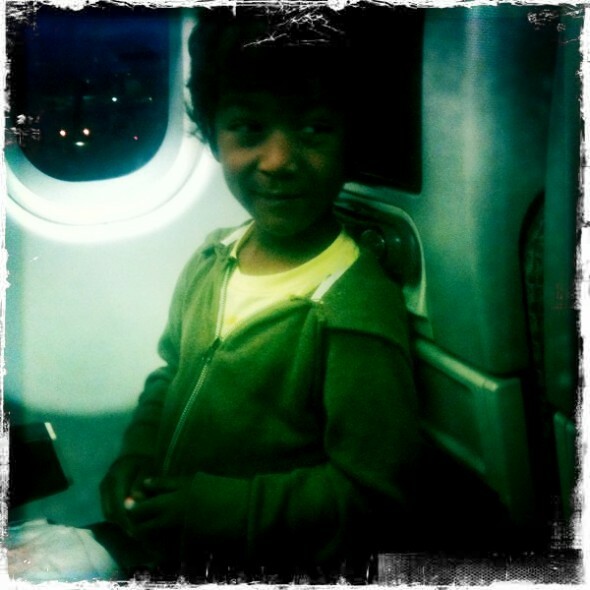 This entry was posted by John Pasmore on Wednesday, September 7th, 2011 at 3:54 pm	and is filed under Travel and tagged with flying with kids. You can follow any responses to this entry through the RSS 2.0 feed.